Although it is not known exactly when the first tapestry was produced in Europe, by the early Middle Ages workshops throughout the continent were producing textile hangings, which were among the most prestigious objects owned by the well-to-do. When some unknown artist or weaver, probably in northwestern Europe in the middle of the 14th century, conceived the idea of representing stories in these weavings—as opposed to merely decorative patterns—tapestry embarked on its own glorious career in the figurative arts. Tapestry bears a close relation to painting; it is a pictorial art and often done on a large scale. Moreover, some of the best tapestries were designed by artists who were renowned painters. Unfortunately, this connection has all too often cast a shadow on the medium in immeasurable ways. Some have viewed tapestries as mere copies of paintings or as little more than interior furnishings, leading viewers and art historians to neglect them or at best consider them of lesser significance. Because tapestries are made of pliable fiber, they can be rolled up and are thus far more easily transportable than framed paintings. This flexibility permitted royalty, nobility, church dignitaries, and other wealthy tapestry owners to bring pieces with them on their travels. Tapestries carried in this manner included relatively small hangings with biblical images that were used as votive images for daily prayer and moments of personal reflection. In contrast, larger tapestries were hung in castles, abbeys, and mansions for decoration and to line drafty halls and rooms in an era before central heating. For major state and religious ceremonies, tapestries were also hung on the outside of buildings, suspended from balconies or attached directly to exterior walls, lining the streets (see illustration to the right). 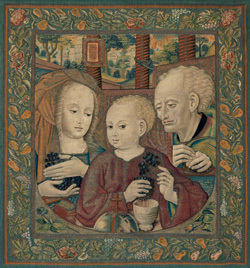 The Holy Family with the Infant Christ Pressing the Wine of the Eucharist, 1485/1525. Southern Netherlands. Bequest of Mr. and Mrs. Martin A. Ryerson. 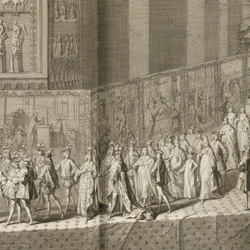 The King Goes to Church (detail) from The Consecration of Louis XV, King of France and of Navarre, in the Cathedral of Reims, Sunday 25 October 1722, c. 1722. France, Paris. Edited by Antoine Danchet. Engraved after drawings by Pierre Dulin.